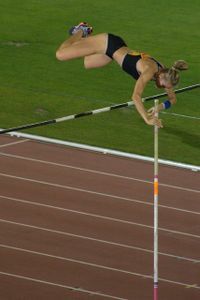 My word is pole vault, and that's what I'd like to see alumni do for current students - pole vault them into the future. As I also work in Recruitment (as well as alumni affairs), I find more and more that the high school students considering university don't understand future career options. They require an authentic voice, not filtered through recruitment officers or faculty, about how important university is to the career of their choice. I am considering holding recruiting sessions not at the high schools or on campus, but at alumni places of employment, so that the high school kids get a chance to see and hear a result of their studying. This will take a lot of planning at my end but the collaborative approach would most definitely be worth it. I hope Nora lets us know if the workplace approach to university recruitment has some success. I have sent Nora a copy of Larry Lauer's Advancing Education in Uncertain Times. My word was pyramid...Pyramid has several immediate connotations when applied to advancement – gift pyramids, engagement pyramids, event pyramids. My thought is to take this in another direction – the pyramids of ancient and foreign cultures, and American higher education's growing interest in internationalism, the growing presence of more diverse student bodies, and the spread of our alumni bodies to farther-flung corners of the globe. My suggestion is this – let's expand on existing partnerships that schools, faculty members, study-abroad programs, and researchers may already have and broaden the involvement of our campus with a sister university in another part of the world. Connect students on both campuses from the time they are admitted and throughout their student experience; enable frequent cross-campus study, visiting professorships, alumni exchanges/travel programs/events, and recruitment. If the sister school is in, for example, India, let their students experience American football in person while our students cheer on cricket. Using video and webconferencing, build multi-campus courses taught simultaneously on both campuses, while researchers collaborate on shared studies, faculty (and administrative) exchanges flourish (and for more than a semester), and students spend a year (and a summer) in each others' backyard. I suggest we deepen what are today pockets of cross-cultural, cross-institutional relationships to be more institutional-wide in scope. I'm sent Kevin a copy of David Kirp's Shakespeare, Einstein, and the Bottom Line: The Marketing of Higher Education. Thank you again to all who submitted entries last month!